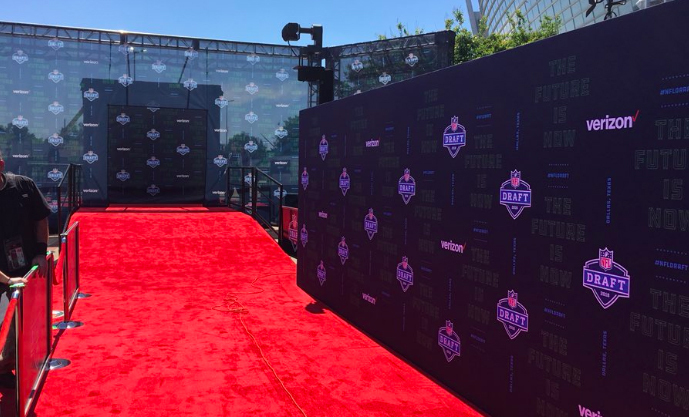 Each year, NFL Media rolls out an NFL Draft production that is larger than the previous one. This year, though, the league’s media arm is taking it to a whole new level. 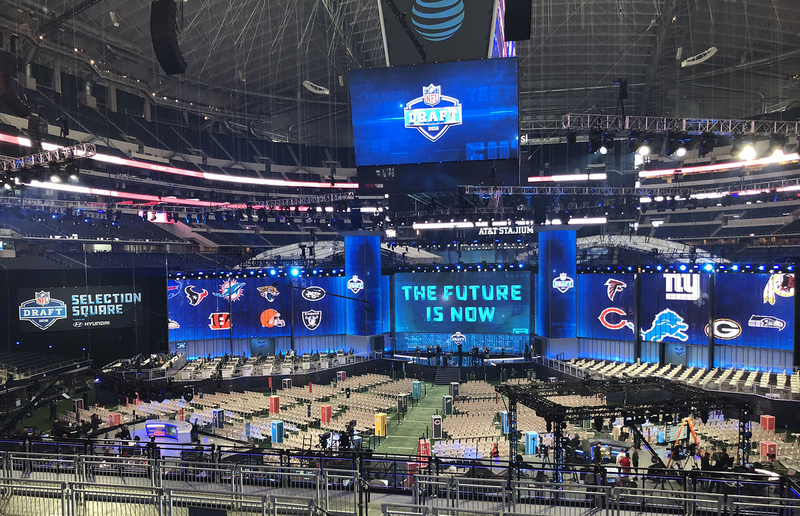 With the Draft located in an NFL stadium for the first time and NFL Network’s early-round coverage being simulcast on Fox (marking the Draft’s first appearance on broadcast television), NFL Media has rolled out its largest Draft production to date at AT&T Stadium in Arlington, TX. NFL Network and Fox are co-branding this year’s Draft coverage on the interior set at AT&T Stadium. 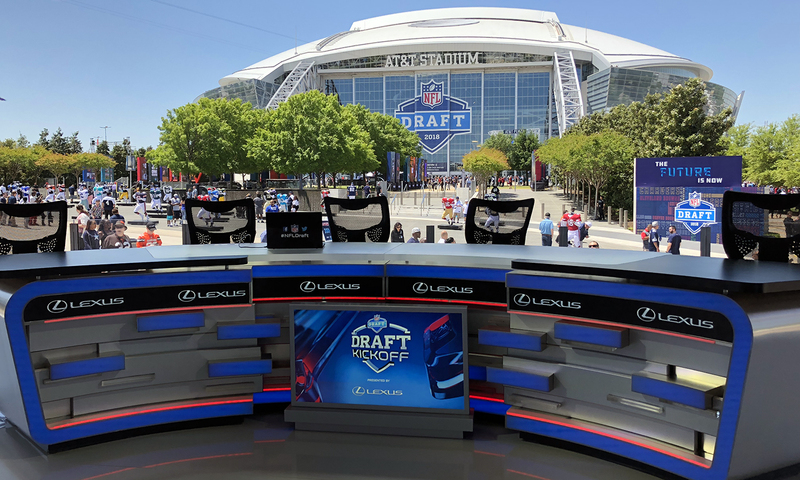 Although NFL Network and Fox Sports coverage will be co-branded and the on-air talent combined (Fox Sports’ Troy Aikman, Joel Klatt, and Jay Glazer are joining the coverage), NFL Media is overseeing the entire production in Arlington. Fox will take a clean feed from NFL Media and insert its own ticker and branding at the Fox Sports broadcast center in Los Angeles. Fox will carry Days 1 and 2 in primetime but not Day 3. 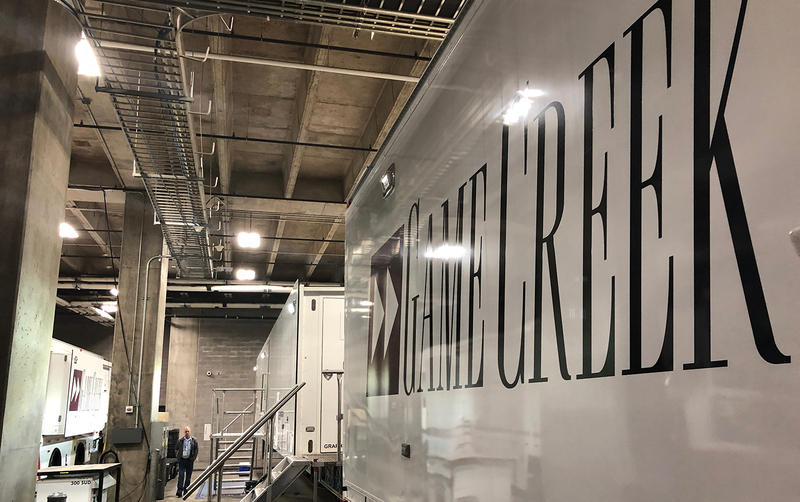 For the second consecutive year, NFL Media has rolled out Game Creek Video’s Encore (A, B, and C units) to serve NFL Network’s growing Draft production. Encore is serving NFL Network’s two primary sets: the interior set inside AT&T Stadium and the exterior set at the NFL Fan Experience. 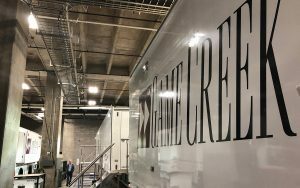 NFL Network is using Game Creek Video’s Encore mobile unit for the Draft this year. The 40×40 exterior set, provided by Filmwerks, is fully enclosed and climate-controlled, but the front windows can be opened, weather permitting. Steve Mariucci, Steve Smith Sr., and Aikman will man the set on Day 1; Chris Rose, Peter Schrager, and Klatt will take over on Day 2. The outside set, which features three hard cameras and a jib, will undergo a makeover each day: casual décor for Good Morning Football featuring comfy chairs and a front table will be converted to a traditional desk setup for NFL Network’s Draft coverage in the evening on Days 1 and 2. On Day 3, the exterior set will become the primary location (the setup inside will be disassembled), and picks will be made remotely from team facilities around the country. NFL Network’s 40×40 exterior set is provided by Filmwerks this year. The set inside the stadium is part of the theater design created by NFL event-production partner C3 Presents. It’s larger than NFL Network’s interior sets in previous years, allowing the operations team to deploy a longer jib arm in addition to four pedestal cameras. The interior set will be manned by Rich Eisen, Mike Mayock, Daniel Jeremiah and Stanford head coach David Shaw (Day 1) or Charles Davis (Day 2). NFL insider Ian Rapoport will have his own location near the stage on Days 1 and 2. Game Creek Video’s Pride (A and B units) is also on hand in the overflow compound outside the stadium, producing Good Morning Football each morning and NFL Network’s Red Carpet Special prior to the start of the Draft on Thursday. The Red Carpet production continues to grow each year and not just on the linear-TV side. In addition to two NFL Network positions (featuring Melissa Stark, Kay Adams, Michael Irvin, and Nate Burleson speaking to prospects), NFL Media will have a sizable social presence, including live-streaming #NFLBlitz coverage on Twitter with Marc Istook and Erin Coscarelli. 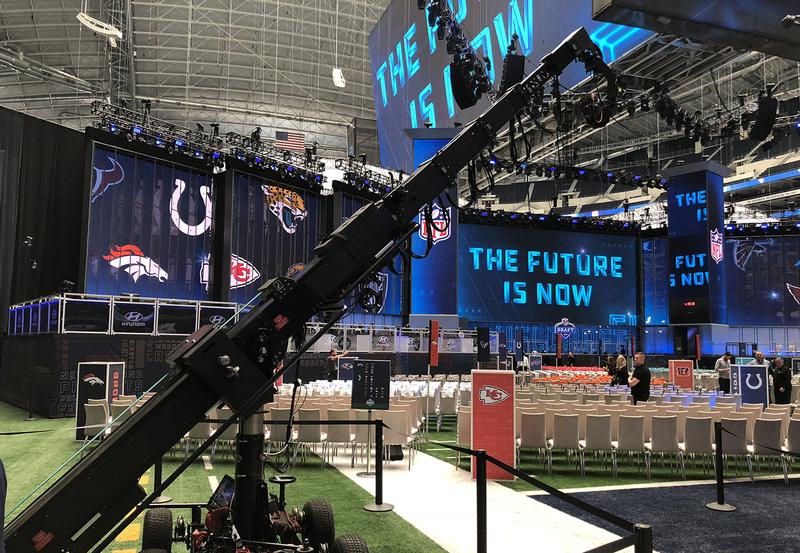 NFL Media has deployed a massive TechnoCrane for its Draft coverage. NFL Network’s camera complement also continues to grow. The network is deploying 32 of its own cameras in Arlington and also taking 12 feeds from ESPN. With more space to cover inside AT&T Stadium, NFL Network has rolled out a MovieBird TechnoCrane to create epic, sweeping shots. This position will be integrated for AR virtual graphics, marking NFL Networks’ first use of AR at the Draft. In addition, a JitaCam has been positioned above the theater area. Outside, NFL Network has an 85-ft.-tall StradaCrane to provide beauty shots of the NFL Experience area. Also on hand are three robos (provided by Fletcher) in the green room and eight RF cameras (provided by BSI), four handhelds (one dedicated to NFL Digital), two Steadicams, one jib, and a Sony F55 4K deployed by NFL Digital to create cinematic content. 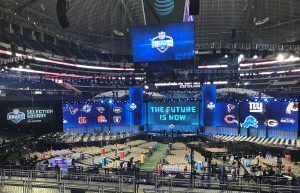 The onsite presence has long been just one part of NFL Media’s Draft coverage, which pulls in dozens of live video feeds from around the country to supplement the show. This year will see the return of the war-room cameras in a record 22 team facilities, offering behind-the-scenes access as team executives make their selections. In addition, NFL Network will have live look-ins at team-specific Draft parties across the country, as well as at prospects who are not in attendance. There’s plenty of space at AT&T Stadium for both NFL Network and ESPN to have a lot of room to work with. 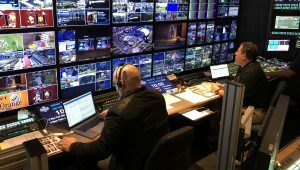 A total of 60 feeds are routed to NFL Media’s broadcast center in Culver City, CA, where a dedicated control room manages all feeds throughout the Draft. Twenty of the 28 video paths coming to Arlington from Culver City are dedicated to these live feeds. The league continues to shift Day 3 of the Draft (Rounds 4-7) to a format in which picks are made from unique locations in each team’s city, rather than onsite at the Draft. Now in its third year, this Day 3 format has required a monumental level of planning over the past few months, with a full rehearsal with all 30 remotes on Saturday morning. They are fed on different paths. All feeds — which are satellite uplink, fiber, bonded cellular, depending on the venue — will be sent to Culver City and then to Arlington for integration into the live show. 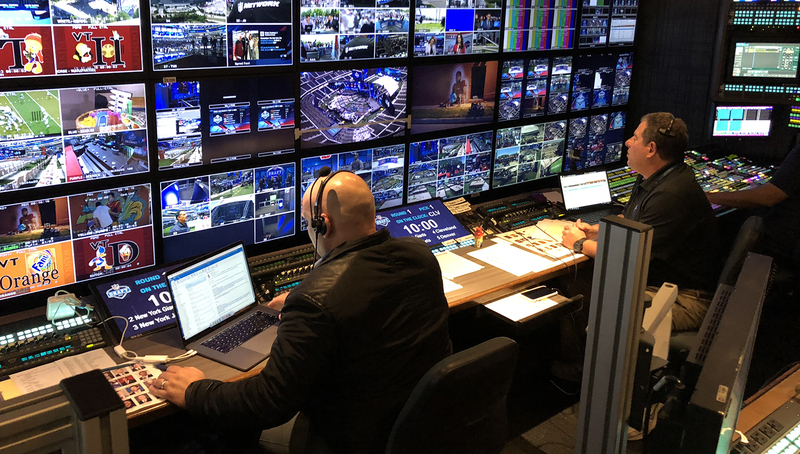 In addition to using Culver City to manage the dozens of live video feeds from various team locations, NFL Media is also leaning on its control rooms for a variety of at-home productions. Mayock’s Mock Draft on Wednesday and onsite editions of Path to the Draft on Thursday and Friday are produced via a control room in Culver City. In addition, nearly all NFL Digital and social-media productions onsite are deploying at-home workflows that leverage Culver City facilities. 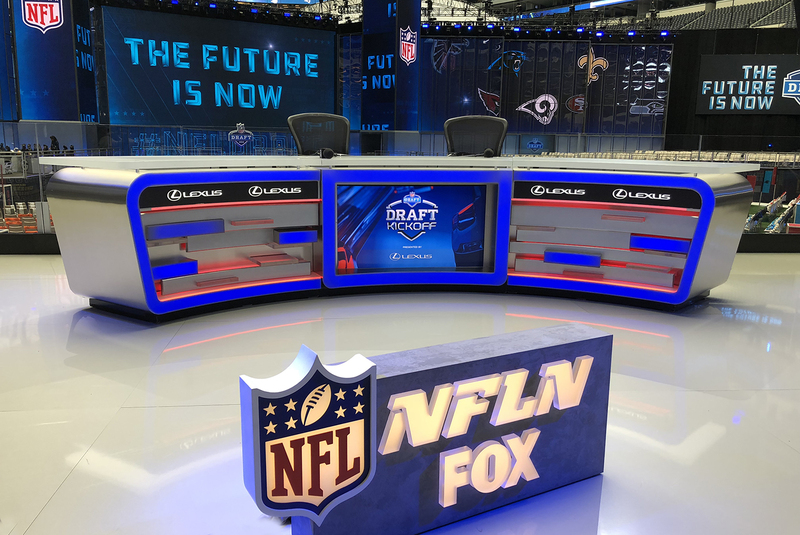 NFL Media is relying on five Azzurro TeamCam systems at the NFL Draft to send a variety of content to its broadcast center in Culver City, CA. 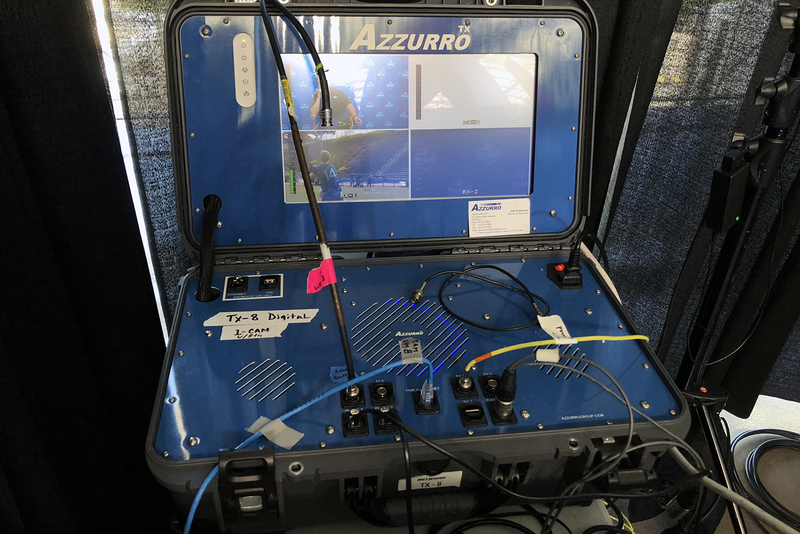 NFL Media is relying on five Azzurro TeamCam systems to send content to Culver City, especially for its news coverage and onsite NFL Digital operation. TeamCam systems are being used for NFL Network’s news position in a stadium suite (delivering live hits throughout the week), for #NFLBlitz red-carpet coverage, podcasts produced at the stadium, draftee interviews for NFL Now Live streaming during the Draft, and for beauty shots and additional content. Although NFL Media has a whopping 800+ player-highlight packages prebuilt and available, the production team has full file-transfer capability to access content in Culver, should last-minute packages be needed. 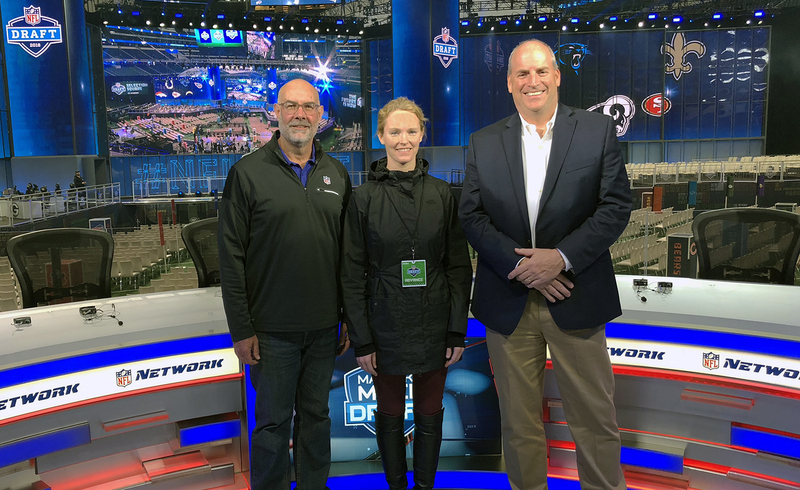 With Shaw, Acone, Mills, and Technical Manager Kevin Reilly leading the way, NFL Media continues to evolve its NFL Draft model. Although the 2019 venue has not yet been announced, Shaw is confident that the evolution and expansion will continue.